Earlier this year we were really blessed to receive our interest free loan from Ark Resources. We joined Liberty Trust in August 2005 and it’s interesting to briefly look back and consider what has taken place since then. Back in 2005 we were living debt-free in our small but comfortable first home. We had two infant children (Hannah and Emily) and a third child on the way. Hence we were planning, in the near future, to move to a larger home due to our growing family – which would of course mean getting a mortgage again. 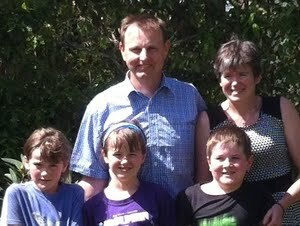 In 2007 we were able move to our new, larger family home and during the move we were blessed by God in so many ways. We are really grateful to have now received our interest free loan and glad that we have been a part of helping to build up the storehouse of money that can be lent to other people. We truly believe that we have been blessed by God beyond all that we could hope or imagine (Phil 4:19, Eph 3:20-21). We would certainly encourage others to join Liberty Trust and be part of blessing others as well as being blessed by this wonderful ministry. Finally, a big “thanks” to the staff who have helped answer all our questions along the way and who continue to keep track of everything and keep us up-to-date with all that is happening with the ministry and our progress in paying back our loan.